If there’s ever a thesis to what I do, I suspect that’s it: everything matters. Especially the stuff you don’t want to. I have been wanting to post on Stephen Graham Jones for a while now, but have been putting it off because when it’s something that means a lot to you, well you want to make sure you get it just right. I’m still not sure that I will get it “just right”, but I did just recently re-read his short story collection, The Ones That Got Away, and so it’s fresh in my mind. And, these stories were just as good reading them the second time around as they were the first. Why? I think it’s because he totally gets it. He seems to understand where fear lives in us. Sometimes it’s back in our childhood, connected to our first group of best friends, or the things that we did back then without fully comprehending the potential ramifications. Sometimes it’s in our adult relationships, based in our weaknesses and failings. Sometimes it’s just the unknown, the monster that is out there that we never even heard about until we’re having to deal with it. We should have cruised the bowling alley on the way up the hill that night, though. One last time. We should have coasted past the glass doors in slow-motion, our teeth set, our hands out the open window, palms to the outsides of the van doors as if holding them shut. The girls we never married would still be talking about us. We’d be the standard they measure their husbands against now. The ones who got away. Several of these stories echo this same feeling of the invincibility of youth, the bittersweet memory we have of how that felt before it was snatched away from us. 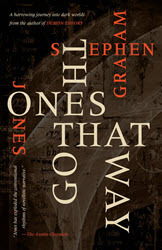 In Jones’s stories, though, this invincibility is not taken away simply by the normal trials of adulthood, but by events, sometimes supernatural, but just as often horrific and haunting tragedies. It’s all in how a person deals with these in the aftermath (well, if they have an aftermath). In some of these stories, it haunts a person until you can’t be sure if the creepy things they are seeing in the corners of those old photographs are real, or if they are just torturing themselves for their own inadequacies, for their inability to let go and just forget. Either way, though, the fear – that’s real. I think the story that sticks with me hardest in this collection is “Raphael”. The kids in this story are a familiar motley crew of rejects, and they find solace in each other. But, one afternoon in the woods, playing at scaring each other with stories – something so innocent that we’ve all done it a hundred times – ends up changing all of them forever. Melanie will stick with me forever, as will Gabe and his sweet, pure love for her. And, as will the image that Jones leaves us with, that one moment suspended in time that changes everything. That one moment that you can’t ever take back. A lot of Jones’s stories have to do with self-sacrifice or the memory of things you can’t take back. In “Father, Son, Holy Rabbit”, the father makes a tough decision in order to save his son. In “The Ones Who Got Away” and “Crawlspace”, we see people who have made decisions that changed everything, and not for the better. But, some of his stories have individuals dealing more solely with the unknown. In some, like “The Sons of Billy Clay”, their very humanity is threatened. In others, like “Wolf Island” and “Lonegan’s Luck”, they have a different, shall we say more complex, relationship with the unknown. The Ones That Got Away will stick with you. It will haunt you because its familiarity shows you just how close you can be to the terrifying without even knowing it. For more on Stephen Graham Jones, check out his website and blog, Demon Theory.